Braeburn, YK - Frigid weather set in across Canada’s Yukon this week. 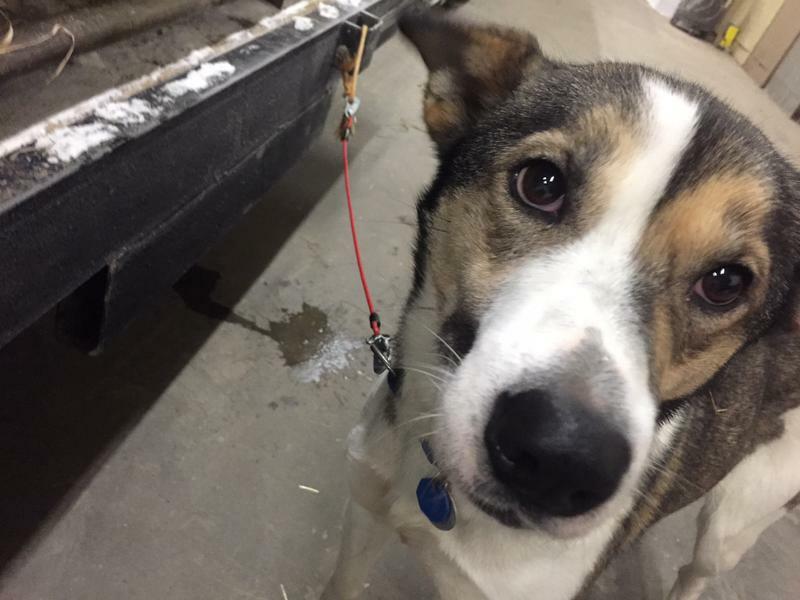 Mushers who left the start line of the Yukon Quest International Sled Dog Race Saturday were uneasy about a forecast that’s calling for subzero temperatures by the end of the week. Midday temperatures hovered around 30 degrees below zero, as dog teams left Whitehorse. But Tagish musher Ed Hopkins didn’t seem to mind. “I like a challenge, I am built for cold weather, I don’t know I just don’t get cold, so I’m not worried about it,” he said. Other mushers aren’t as confident about running their teams north straight into a head wind. “You know, it’s a mile at a time,” said Scott Smith of Willow. Both mushers and sled dogs risk dehydration and frostbite. If dogs left the start line running hard at a lope, they could have a hard time recovering from even a single long run. But Norwegian Joar Ulsom said his dogs are ready. They are wearing custom-made coats from Norway. “When I dress for these cold races, I always wear wool from the inside out and as a layer to protect from the wind,” he explained. “I thought that would be the same case with the dogs. Someone in Norway started making dog coats with wool in them, so they’re really warm,” said Ulsom. 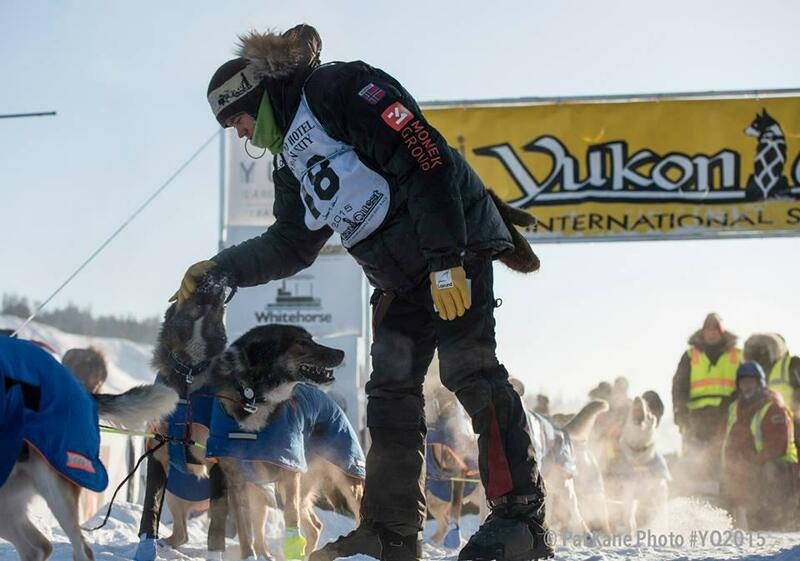 Joar Ulsom greets his lead dogs just before they leave the start line. His dogs are wearing custom coats lined with wool to stay warm. This early in the race, it’s crucial mushers are attentive to their dogs. Environment Canada has issued an Extreme Cold Warning for Dawson City, the race’s halfway point. Temperatures there could dip below minus 50 degrees. Fairbanks, AK - Mushers lined out their dogs for the race start in downtown Whitehorse this (Saturday) morning. Right after musher Allen Moore wearing bib #1 left the start chute, KUAC's Emily Schwing in Whitehorse spoke with Lori Neufeld in the KUAC Fairbanks studios. 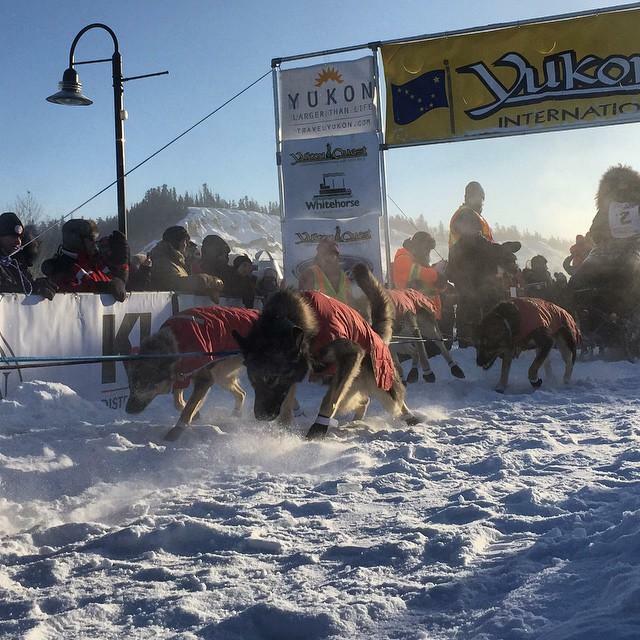 Fairbanks, AK - More than 20 out of the 26 Yukon Quest teams are out of the start chute in downtown Whitehorse and are making the 1000 mile journey to Fairbanks. Fairbanks, AK - Long distance mushers who drive sled dogs in the Yukon Quest International Sled Dog Race don’t get a whole lot of sleep. 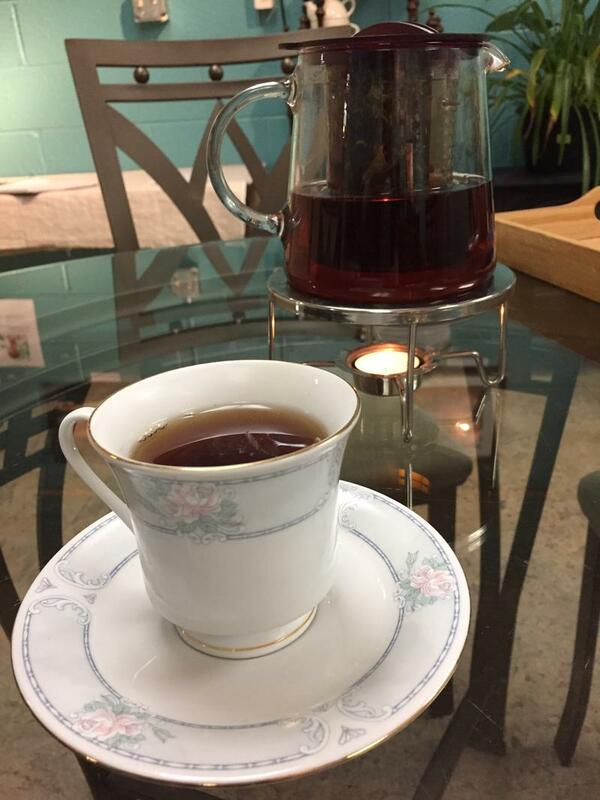 But Race Director Marti Steury says the race has found a few sponsors who are willing to help keep them awake. “Rumor has it that we are the best coffee and tea race in all of the mushing circuit which I wasn’t really aware that that was something to strive for,” laughed Steury. Fairbanks, AK - Of he 26 mushers signed up to race dog teams in this year’s Yukon Quest International Sled Dog race, 10 are rookies. They might be new to the race, but a few trained dog teams with a handful of well-known and champion long-distance mushers. Fairbanks, AK - Over the weekend, veterinarians looked over the sled dogs that will run the Yukon Quest International Sled Dog Race in both Fairbanks and Whitehorse. They wanted to make sure the dogs were healthy, well-fed and ready to race on the 1000 mile trail. Inside a large warehouse, veterinarian Nina Hansen checks the paws and teeth and listens to the heart beats of sled dogs. 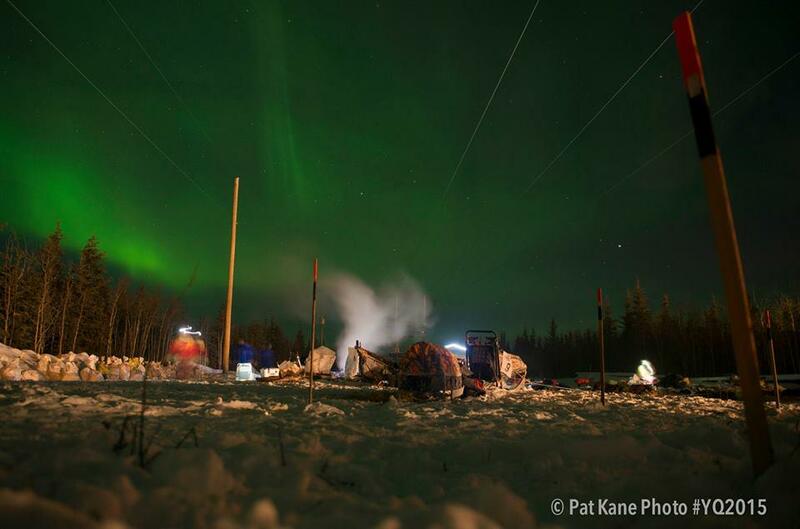 Fairbanks, AK - The Yukon Quest International Sled Dog race starts Saturday. For more than 30 years, the race course has followed an old Gold Rush era trail that took advantage of the frozen Yukon River. But recently, there have been places where the river hasn’t frozen up. That’s starting to raise question about the impacts of climate change on Alaska’s state sport. A little open water on the Yukon Quest trail is nothing new. “It isn’t precedent setting,” said Yukon Quest Executive Director Marty Steury. She’s been with the race from the very beginning.